On today's episode of Decoding Chicken Laying Issues, we'll take a look at ten different egg oddities any keeper of chickens may run across, along with possible explanations for said oddities. Let us begin! 1. My chicken laid a tiny, little baby egg! Has your chicken laid something that looks like it fell out of a songbird's nest? You may be wondering what you're going to do with eggs that tiny? Save up a dozen to make one serving of scrambled eggs? If your birds are young and have just started to lay, there is no reason to worry. Their eggs will likely get bigger. 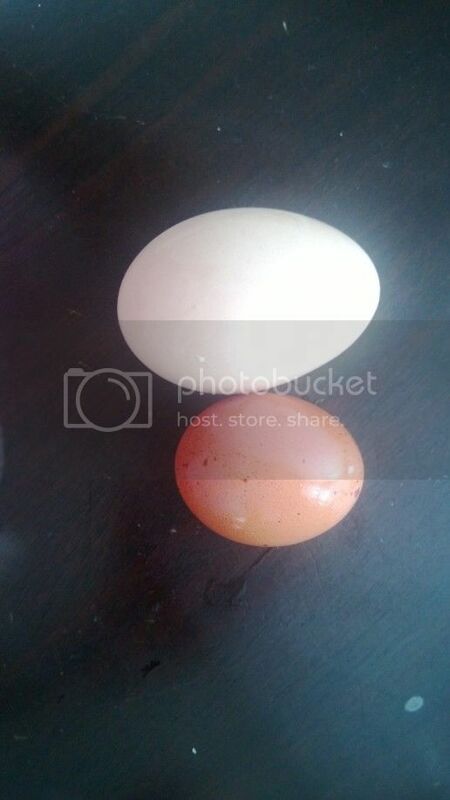 Egg size depends on age and breed of chicken. As chickens get older, their eggs will get larger. Egg size can also be influenced by a hen's weight. Smaller hens will lay smaller eggs, which is why it is important to be sure your chickens have plenty of food and fresh water--so they can grow into big, fat, happy hens. If your chicken is full grown and has suddenly gone from laying normal sized eggs to small eggs, then you may have a problem. This is generally a sign of stress due either to an illness or something in its environment, such as temperature extremes, constant threat from predators, molting, attacks from other chickens, or restricted access to fresh food or water. Rarely, small eggs can result from a nutritional deficiency, such as a lack of salt. Be sure your chickens nutritional requirements are being met. Make it a habit to observe your chickens frequently, watching them interact with one another, and taking note of their living conditions. When you observe your chickens regularly, you are more likely to notice a stressor, and will be able to tend to the problem sooner. 2. My chicken laid a giant egg, and it has more than one yolk in it! Every once in a while, we'll get a huge egg, and I'll think Yikes, that had to hurt! And when I crack it open, sure enough, it's a double-yolker. But why do chickens sometimes lay eggs with more than one yolk? This occurs when two ova (egg yolks) are released at the same time due to a glitch in the egg-making process. Either ovulation has occurred very rapidly, or one of the ova got hung up for some reason. Some chickens are more prone to lay this type of egg than others because it can be a genetically inherited trait. The only time an egg of this type can be a problem is if it is so large to cause egg binding--where the egg actually gets stuck in the chicken. It will usually be fairly obvious that this is the case, because you will notice the chicken straining to lay and perhaps see the egg partially protruding from the chicken. Generally, however, double (or triple or quadruple--heck, the world record is nine!) yolked eggs are nothing to be concerned about. And after your hens lay a few of them, the novelty wears off. 3. My egg has NO yolk! A yolk-less egg, also known as a wind egg, generally comes from a pullet who is just beginning to lay, and is nothing to be concerned about. It can also occasionally happen with a mature laying hen, when her reproductive system mistakenly treats a bit of egg white like a yolk and forms a shell around it. Like the double-yolked egg, it is usually just another novelty that one will encounter when raising chickens. 4. My chicken laid a giant egg...and there's another egg inside of it! Occasionally, an egg will get hung up inside the chicken, causing another shell to form around it. If your chicken lays one of these double shelled eggs, consider yourself lucky, because it is very rare. As with the double-yolked eggs, this is usually nothing to worry about, unless it is a source of egg binding. 5. My chicken laid a wrinkly or misshapen egg! There are a couple different reasons your chicken might give you a wrinkly egg. One possible cause is that two yolks got released very close to one another. This would cause one egg to be right on top of the other, pushing on it as the shell formed, resulting in the wrinkled shell. Shells that are wrinkly for this reason are generally not a problem for your chicken, and are not all that unusual. However, occasionally a wrinkly shell can indicate a nutritional or health problem in your chicken. For example, if the wrinkly shell is accompanied by a drop in production, sneezing, and nasal discharge, your chicken may be suffering from infectious bronchitis, caused by a virus. That is why it is so important to keep your coop clean by regularly removing soiled litter. A dirty coop will spread illness, which can result in laying problems. 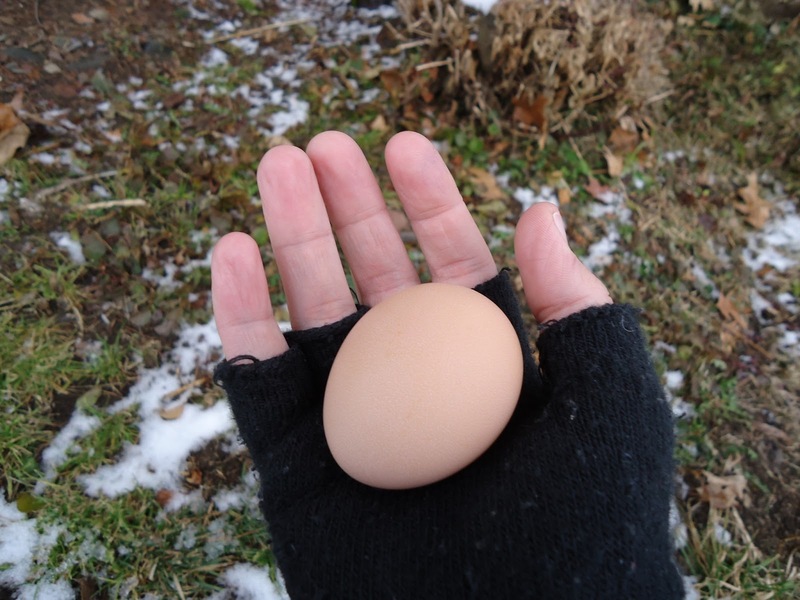 If egg shells are persistently wrinkly, be sure to clean your coop, check that the chicken is getting enough to eat, has plenty of water, and is otherwise not under any kind of stress. 6. There's blood in my egg! I think at one time or another, whether it was a store-bought egg or a homegrown egg, everyone has cracked open an egg, only to be greeted by an unsightly, little clump of blood. As unappetizing as it may seem, it is nothing to worry about, and perfectly edible. A blood spot can be formed if either a bit of blood was released by the hen during ovulation, or if a chick started to develop. In either case, you can simply remove the blood fleck if it bothers you that much. Or, if you are gross like me, you can just eat it. 7. There's blood on the egg shell! Ah, yes, the old bloody egg gag. Good one chicken. A bloody shell may occur in a hen who wasn't quite ready to begin laying--meaning as the egg passed through, it tore some of her tissue (ouch, poor girl). While this is probably uncomfortable for the poor hen, she will adjust and should be able to lay with no problems after that. Take note, however, that a bloody egg can indicate a problem, especially when accompanied by bloody droppings. A rare condition called coccidiosis, a disease that causes intestinal bleeding, can also cause blood to be deposited onto eggs. This is another condition that can be prevented by keeping your coop clean. 8. My hen is laying eggs with very thin shells! A thin shelled egg can once again be blamed on a hen that has just begun to lay (those pullets are trouble makers), and will resolve on its own once the chicken has matured a bit. It can also be caused by an older hen, whose egg size has gotten larger; the same amount of shell must stretch to cover the larger egg, thus resulting in a thinner shell. A thin shell can also be caused by a nutritional deficiency of some kind, usually potassium or vitamin D. During the winter, there may not be a whole lot that can be done about the vitamin D, since this vitamin comes from the sun (meaning that thin-shelled eggs can be common in the darker fall and winter months). You should try to get your chickens out in the sun as much as possible, however. Potassium, is easy enough to supplement; this is done by adding two tablespoons of apple cider vinegar (be sure it is unpasteurized and unfiltered) to every gallon of your chickens drinking water. If the shells are very soft, it could also indicate a lack of calcium. The solution to this is to feed egg shells back to your chickens. Just be sure you break them up finely when doing so, otherwise, they may develop a taste for their own eggs (see #9). If you'd rather not risk feeding them shells, you can try crushed cuttle bone. Finally, another possible cause for thin egg shells is--you guessed it--illness and stress. Are you starting to see a pattern here? Care for your chickens well--plenty of food and water, clean living conditions--and they likely will not have any laying problems. 9. My egg has cracks and holes in the shell! Sorry, but I think your chickens are eating their eggs. The holes and cracks are caused by your chickens pecking; you may even find half eaten eggs. If your chickens are lacking in either calcium or vitamin D, they may begin to eat their own eggs. You will want to nip this in the bud right away! It isn't a habit you'll want your chickens to get into, because obviously, if they're eating their eggs, you aren't. Preferably, you want to be sure their nutritional requirements are being met beforehand so that this never becomes an issue, but I suppose if you're reading this, it may be too late for that. Firstly, you will want to be on top of collecting eggs. By observing your chickens regularly, you can usually figure out what time they normally lay--chickens are fairly predictable that way. Secondly, you will want to do what you can to increase calcium and vitamin D. For calcium, as mentioned in #8, crushed egg shells or cuttle bone offered to your chickens should be satisfactory. As for the vitamin D, it is essential that your chickens are allowed time to roam outdoors in the sun. It is harmful for chickens, or any living creature for that manner, to be forced to stay strictly indoors. Fresh air and sunshine are essential for healthy chickens! 10. The color of my chicken's egg has changed! A little color variation is normally not something to be too alarmed over. Egg shells may pale during the summer months due to the increased temperature and exposure to sunlight. However, a very noticeable paling of egg color, accompanied by a drop in production, can indicate stress or illness. Again, keep things clean and provide plenty of clean water and proper diet. A virus known as egg drop syndrome has also been found to cause paling of egg shells. This virus can be introduced to chickens by waterfowl, such as ducks or geese. Luckily, this condition has not yet been documented in North America. There are many more funky egg issues that could be listed, but these are some of the more common ones. If you have a weird egg story to share, please let us know in the comments section below! 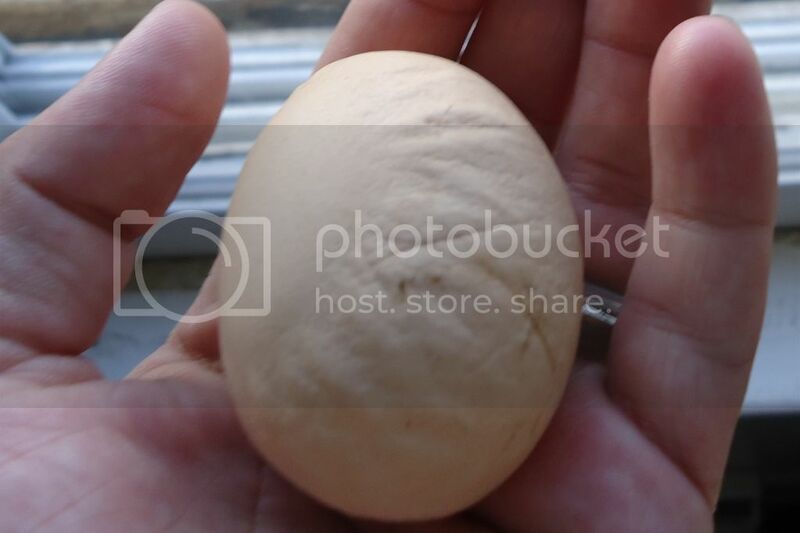 Do you have a picture of a weird or unusual chicken egg? Why not submit it to the We Like Making Our Own Stuff's Facebook fan page album, "Weird Chicken Egg Gallery." Just post your picture to the fan page's wall, and I will put it up in the gallery! Backyard Chickens, "Interesting Facts About Chicken Eggs,"
The Chicken Vet, "Egg and Laying Issues,"
Thank you! I've often wondered about the wrinkly eggs! You're welcome! We got a couple wrinkly eggs last year, which is part of what prompted me to research this topic. This is freaky one of my chickens (a Pullet) just laid an egg 10 minutes ago, soft shelled, with an umbilical cord and what looked like a deformed egg yolk. I scooped it up took it inside and with my mobile took a video of the egg as I attempted to break it in half. To my shock there was an egg yolk intact in the egg with an unbilical cord attached to the egg yolk, the cord was looped around and around and around and it went out through the centre of the fat part of the egg (not the pointed end) through to the freaky looking egg yolk. Any one ever experienced this with their chickens? These are pullets that just started laying last week. I don't have any roosters just 4 pullets. I buy chicken eggs from a local organic family farm. About two months ago I found an egg that felt "empty". I haven't cracked it yet as I was waiting for the grandkids to visit over the holidays hoping they would find it interesting. Anyway, shining a bright light through it looks like it is a small yolk firmly attached to one side...no albumen at all. I've heard of no yolk eggs, what about no albumen eggs? Recently one of our hens laid a Giant egg which contained another entire egg. Today i noticed she was starting to act the same way as before. We picked her up as we were gunna place her in a pen by herself to lay it. However when we picked her up and tried to give her olive oil (to aid in the laying) she discharged a messy pile of stuff. no yolk, the shell was soft long and totally unlike anything described. was long thin, then larger . The white of the egg was on the outside. why did this happen? One of our chickens played a double shelled egg the other day and it was cool to see and I was wondering why it happened, the smaller egg inside had a super soft shell and no yolk and the bigger egg obviously had a egg and yolk inside, we didn't eat it but it was cool to see, anyways thanks for posting the article. When I was in Girl Scouts, one of the girls in my troop said she saw a triple yolk egg one time. For the past 2 months, my 14 chickens have laid all white eggs, with one brown egg each day... today we got white, one brown, and one GREEN egg! Did one of my white egg layers do that? Is it something I should worry about?